I didn’t get to far on this beautiful trail until I found a dozen spots I had to paint. 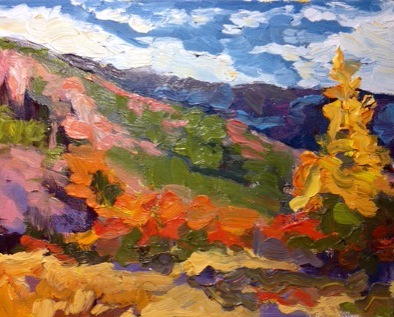 The trail was rebuilt this summer and I am grateful, to be here walking, for the trail, for time to walk and paint. Hi Julianna, I like your bold color and technique (style) in these paintings. How long will you be at the ranch and is the whole family with you? Let me know when you will be back so we can get together.